We all know how much we struggle to read wiring diagrams properly. And I know you are completely at “no fault zone” with this. With many electrical symbols, it is very difficult to remember every one of them and using them while solving a circuit diagram. But there is an easy way to remember them. And believe me when I say its easy. With my graduation in electronics, I have used this trick and was able to solve many circuit diagrams. The trick is: Learn to read electronics symbols. And these symbols are useful also if you are from the electrical stream. With this trick, I was able to read a multimeter, calibrator and most of the electrical tools without hassle. Yes, you read it right. Let me reveal little more on this trick. There are many symbols and it is impossible to learn all of them. But you can learn some of the basic ones. And these symbols are useful also if you are from the electrical stream. In a very layman term, these are the diagrams assigned for different electrical and electronics tools. You have already seen them in your laboratory machines, daily use electrical appliances or other places. An electronic symbol is a pictogram used to represent various electrical and electronic devices (such as wires, batteries, resistors, and transistors) in a schematic diagram of an electrical or electronic circuit. In the above image, some of the electrical symbols are presented. So, basically, these are just the representation of different electronics and electrical devices. And if you have learned these electrical symbols well, you can solve the schematics and will be able to do wiring in your projects easily. Note: Electrical and Electronics symbols are same. Don’t get confused. Now let’s move to another definition. A Wiring Diagram is a simple representation of the electrical circuit diagram showing a connection between power and signals between different devices used in that circuit. Now that you have understood the basic definitions, we can go further and tell you how you can use these electrical symbols in reading wiring diagrams. Let me show you a simple diagram that I have made to make you understand more about the topic. As you can see this is the simplest diagram with most general components symbols used in the majority of the circuit. It has a resistor, a capacitor, a diode, a bulb, switch and a battery. I assume that you have already seen the electronics symbols in the above image. And now you have got the point of the discussion. You will get more clear about these once you go through all the symbols I have listed below. Simple Wire: It simply represents a simple wiring between 2 points. Note that there will be no other connection in between these 2 points. Connected wires: Whenever, the 2 wires connect at a point, they are called as connected wires and mainly represented by a junction symbol (refer below table). Disconnected or Not Connected wires: Sometimes we have to show wire below or above to the other perpendicular wire. The situation is like: The wire is crossing other wire but is not connected. That time to show disconnected wires, this electrical symbol is used. Variable resistors: A resistor which provides a different value of resistance to the circuit is called variable resistor. This resistor mainly comes with a slider connected to it. It is also called Rheostat. Trimmer Resistors: A trimmer or preset is a miniature adjustable electrical component. It is meant to be set correctly when installed in some device, and never seen or adjusted by the device’s user. Trimmers can be variable resistors (potentiometers), variable capacitors, or trimmable inductors. Thermistor: Thermistor is a combination of thermal and resistor. It has a negative coefficient resistance and its resistance is dependent on temperature, more so than in standard resistors. This table describes symbols for various types of resistors. A Capacitor is a two terminal passive device used to store energy in the form of electric charge. It is comprised of two parallel plates which are separated from each other either by air or by some other insulating device like paper, mica, ceramic etc. The electronics symbols used for this this is 2 parallel lines. For more about types of capacitor, read: Capacitor types. It acts as short circuit with AC and open circuit with DC. 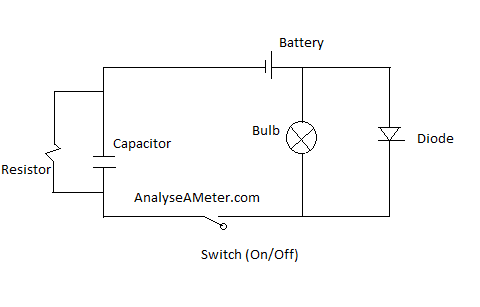 Capacitor is the most used electrical component in wiring diagrams after resistor. Simple Capacitor: It is a representation of uncharged capacitor. It means that the switch is off and capacitor is not charged. Polarised capacitor: This symbol is used when we need to show that the capacitor in the circuit is charged i.e. polarised. Variable capacitor: This capacitor has different value at the different point. An Inductor is a coil shape device which is used to produce electromagnetic field. It is a passive 2- terminal electrical component. The more turns, the higher the inductance. The inductance also depends on the shape of the coil, separation of the turns, and many other factors. The electrical symbols for inductor is given in the below table. We are sure that these electronics symbols will help you in your studies. We will update the list with more symbols used in wiring diagrams.